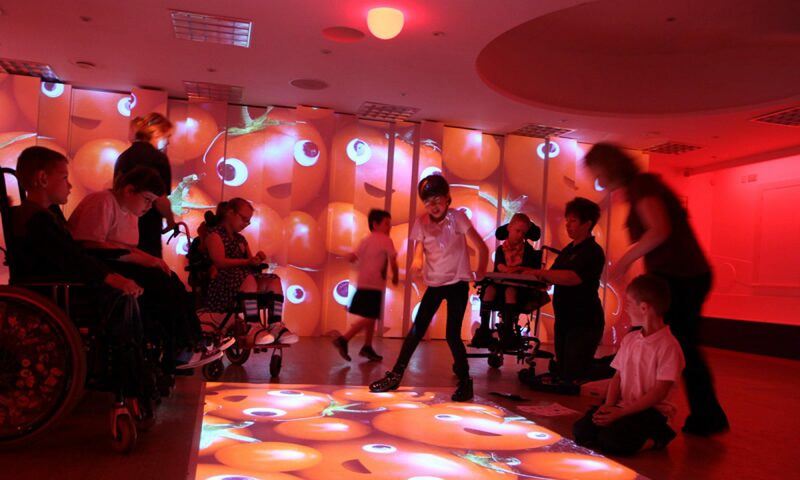 4D were commissioned to design a space that would work as a sensory studio for pupils with a wide range of learning needs but, also as a new engaging hub for curriculum based lessons. It was vital to Hebden Green that the studio became an inclusive space that could be accessed and enjoyed by everyone in the school. A space where all pupils could take something from their immersive experiences. The physiotherapy department were also very keen for the space to provide rewarding interactivity which would encourage movement. 4D worked closely with Hebden Green School to create an immersive space that could be used across the curriculum at both primary and secondary levels. This included whole school performances which play a big part in Hebden Green’s school calendar. We created a space that lent itself to inspirational lessons! Full-scale projection filled one wall, whilst a curved wall featured a second projection area. This curved space worked as an excellent area for one-to-one work as it felt safe and could easily be turned into an enclosed environment with den making kits. 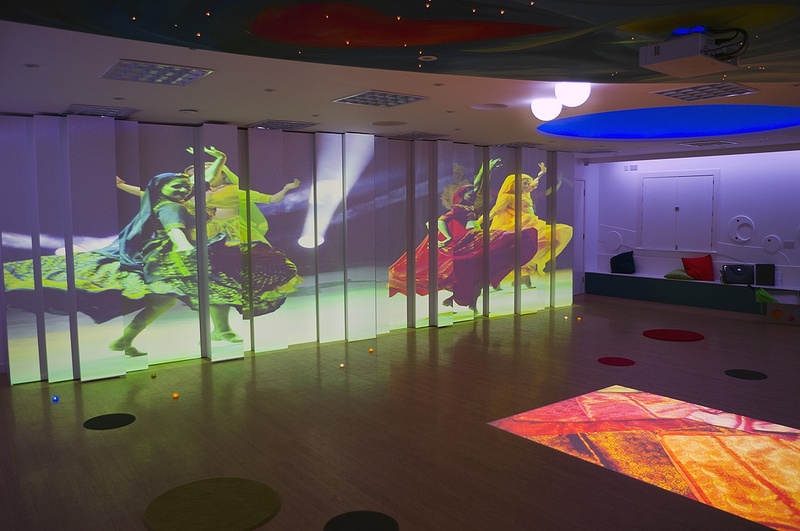 The school were keen for this space to be much more than a sensory room – they wanted a dynamic teaching tool. With the 4D create software, teachers are using the preloaded immersive content and designing their own images, sounds and videos to create bespoke lesson plans. Inclusivity was another key area for the school and we achieved this in a number of ways. An interactive floor fitted to the centre of the space meant that the smallest of moves could create a huge change. One lesson run by maths teachers uses the interactive floor as a giant board game that pupils can interact with. This is a fun and engaging way to learn about shapes, movement and angles! Wireless switches were also included into the space which meant those pupils with limited movements could change lighting, sound and projection through assistive touch technologies. To create the performance space the school needed, industry standard lighting, sound and projection gave pupils and staff the ability to stage magical and engaging performances for parents and the local community to enjoy.